The World Sustainable Energy Days - one of the largest gatherings of its kind - are currently underway in Wels, Austria. Energy experts from 61 countries convene to take part in three conferences (European Pellets Conference: 28 February - 1 March; the European Energy Efficiency Conference: 1 March; the Conference on the "Energy Future, 2030": 2 March) and a seminar on "Rural Development & Sustainable Energy" (1 March). The Energiesparmesse, running from 1 - 4 March, looks at the latest developments in energy conservation and efficiency. Some notes [*German] on the European Pellets Conference [*.pdf, overview] as it relates to Austria have meanwhile been published. Biomass fuel pellets are a clean, CO2-neutral and conventient fuel with rapidly growing market shares in many European countries (statistical overview: earlier post) and showing a growing global trade (earlier post on a large Swedish-owned pellet plant based in the U.S. aiming to supply Europe, on pelletiser in the Republic of Congo that will be producing 500,000 tons for exports on a large South African plant with similar goals, and on the Port of Antwerp's activities of building infrastructures to accomodate this trade). Biomass pellets are most often made from wood chips and forestry residues or from woody energy crops grown on dedicated plantations, even though dedicated herbaceous feedstocks (fast growing grass species) are receiving more and more attention as well (earlier post and here). The fact that biomass has become directly competitive with fossil fuels (earlier post), has sparked a real investment boom in Austria: over 28,000 small biomass burning installations have been built, 12,000 of which utilise pellets; 528 medium-scale, highly efficient combined heat-and-power (CHP) biomass plants have been established (235 of those being district-heating systems) and 9 large biomass cogeneration plants, which are considerably more efficient than traditional utility-scale power plants (earlier post), replace an increasing amount of coal and oil in the country. Last year, Austria used more than 1 million tons of biomass pellets for the first time, saving over a million tons of CO2. This places the country second after Sweden. Austria's production doubled between 2004 and 2006. When it comes to utilising the pellets, Austria ranks fifth after Sweden, the U.S., Denmark and Germany. It was noted that since December last year, pellet prices have shown a downward trend, after highs of €199 per ton in November. A relatively stable price is seen as a crucial aspect for creating consumer acceptance of the biofuel. 2. incentives for production increases: during a round-table, the Agrar-Landesrat (regional minister of agriculture) and the pellet industry have agreed to quadruple pellet production provided the government works out tax incentives for the companies involved. 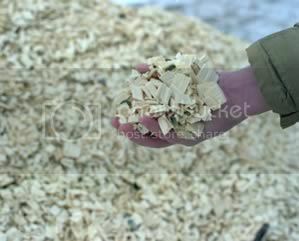 3. the establishment of a pellet reserve: in order to strengthen continuous supplies and to offset sudden shortages, the state has studied the possibility of creating pellet reserves; a proposal is on the table to force pellet producers to stock 30% of the quantity they're projecting to sell during the winter season. Under the scheme, stock building will be initiated from September onwards and reach their maximum at the end of November, after which the build-down follows until the end of January. We will be reporting on other aspects of the conferences hosted by the World Sustainable Energy Days, as soon as more information becomes available. AlgoDyne Ethanol Energy, announces that it has developed a new process to harvest significant amounts of biomass from marine algal blooms. Massive marine algal blooms occur in almost all oceans of the world, often caused by man-made nutrient pollution, and are known to be harmful to the aquatic ecosystem. AlgoDyne believes that its harvesting technology could yield huge amounts of biomass usable for ethanol production at virtually no cost, and this harvesting of harmful algal blooms will ultimately protect the ocean’s marine ecosystem. Mr. Richard Ritter Von Raffay, President of AlgoDyne states "To be able to use our harvesting technology to improve the quality of our oceans and remove harmful algal blooms is a significant accomplishment for the company and the environment." AlgoDyne is a company that develops micro-algae technologies it thinks will provide a means to produce clean, renewable energy from the continual harvest of biomass from photo-bioreactors. The end result is the production of ethanol, methanol, biodiesel, electricity, coal and animal feed – all in a carbon dioxide neutral way. Earlier, we had an in-depth look at biofuels from algae, and found that, despite the publicity, no company has ever achieved large-scale, efficient and affordable production. Photobioreactors are relatively expensive and require a large amount of materials, the production of which is energy intensive, whereas algae production in open ponds yields low and unnstable amounts of biomass. Large scale trials that took place in the 1980s yielded interesting results (earlier post). AlgoDyne's concept of harvesting algae from the wild is not exactly new. Many similar ideas have been proposed in the past, most notably those of harvesting sea-weeds such as kelp on a large scale to utilize the biomass for energy. Several small companies have also been harvesting wild algae from lakes, with specially designed harvesting machines, for years. The process is energy intensive and cumbersome. It remains to be seen whether AlgoDyne's idea to actually collect phytoplankton from the open oceans is practicable. It basically remains an activity that can not be planned, scaled or rationalised, as algae blooms have the tendency to grow and disappear suddenly. The company gave no details on the innovation it claims it has made, nor in which way it differs from the many harvesting technologies that have been tried. We will be following up on this story when more information emerges [entry ends here]. On Friday, Brazil, the European Union, the United States, South Africa, China and India will formally establish the 'International Biofuels Forum'. The idea is to create common norms and standards for bioenergy products, especially ethanol, to consolidate and facilitate world trade in the rapidly growing sector. The initiative behind the new international organisation, the offices of which will be based at the United Nations (UN) in New York, was taken by Brazil, the world's largest biofuels producer. Information supplied by the Brazilian Foreign Office and obtained by the ANBA shows that Brazil is ahead of this project, sponsoring the idea of making the main producers and consumers of biofuels join forces and create common technical norms for the sector as well as production, transport and storage standards, among other topics. With this, the countries participating hope to transform products like ethanol and biodiesel into 'energy products', instead of 'agricultural commodities', as they are currently labeled under WTO classifications. The Brazilian government has been analysing the consequences of this transformation for a while (earlier post). In the evaluation of the government of Brazil, the expansion of the use of biofuels is going to cause partial replacement of oil derivatives, reduce emissions of polluting gas, as well as attract investment to the productive chain. According to the Ministry, clearer international norms, are going to provide incentives to the private sector in Brazil and in other countries. Apart from that, the diffusion and increase of production is going to generate clear economy of scale and, consequently, a reduction of cost. To the government of Brazil, the production of biofuels is an important vector for development. In Brazil, the sugar and alcohol sector has a turnover of around 40 billion Reais (€14.2/US$18.8 billion) a year and generates 1 million direct jobs, according to the Ministry of Agriculture. Production of biodiesel in commercial scale is only beginning in the country and the government has crafted policies that ensure the biodiesel program will benefit more and more small producers of oleaginous plants, like castor seeds, for example (earlier post). Brazil and the United States, which are the two main international producers of ethanol, have been mouthing their intention of transforming alcohol into a great international commodity. This will be the main theme of the meeting that presidents Luiz Inácio Lula da Silva and George W. Bush are going to have on March 09, in São Paulo. The Brazilian Ministry evaluates that the Forum and dialogue about the sector between Brazil and the US are not mutually excluding, but complementary initiatives.